A crack in a glass aquarium can make a mess, and it doesn't take much to create a crack, especially in older aquariums. If you have children in your home, your chances of needing to fix a crack are even greater. 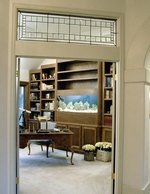 Fortunately, fixing cracked aquarium glass is fairly simple and doesn't take much effort. Move the fish to a secure backup tank. If you can, use water from the current tank, to prevent a change in water temperature. Remove decorations from the cracked aquarium and set them aside, and then drain the tank. Use care when draining to prevent putting extra pressure on the crack, which could make it worse. Dry the tank out with paper towels. Wet a paper towel with white vinegar. Clean the glass near the crack, on both the inside and outside. This will allow the silicone to stick and seal the crack. Rinse off the vinegar, and dry completely. Purchase a tube of aquarium-safe silicone gel. Many types of silicone have chemicals that are harmful to fish and other marine life. The gel should be clear, and free of any anti-mold additives. Place the silicone gel tube inside the caulk gun. Start inside the tank, and apply a thin layer of the gel to the crack. Wet a finger and smooth it down so that it fully seals the area. Do the same on the outside of the glass. Allow the silicone to dry, or cure, for at least 48 hours before you add in any water. Once the silicone is set, pour water into the tank, and let it sit for a day or two, to make sure the leak is fixed. If the crack is sealed properly, redecorate the tank, preparing it for the fish, and then move the fish back to their original, newly repaired, aquarium.